This latest German R/C safety item allows you to run two 6:volt batteries, and as you can see all the main functions such as Elevator/Rudder/Aileron leads that plug into the Rx already have filters fitted!! There is no battery plugged into the Rx!! 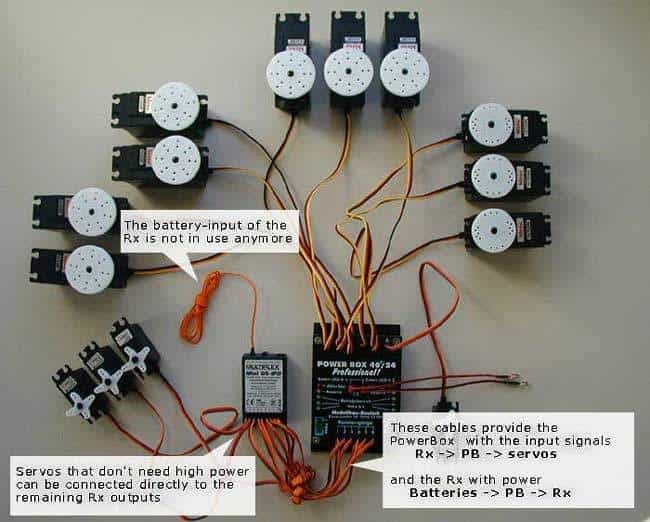 From the 6 servo leads that are plugged into the P/Box you can then have 24 servos coming out!! That means I can run 24 servos in all! All of the necessary servo amplifiers are built into the P/Box!! Plus it automatically checks that all servos receive the correct servo impulse!! The Power Box items are hand made by Emmerich Deutsch. His products are now considered by reviewers in both FMT & Modelle magazine to be some of the very best on board safety items currently available. They are far more than just a high quality battery backers! You can incorporate the PowerBox the same way you would with a “standard” Rx. Connect the batteries with the PowerBox and the Rx channel outputs to the PowerBox channel inputs. Two of the three wires of each cable are used for the power supply from the PowerBox to the Rx. The remaining third wire of each cable transmits the signal from the Rx to the PowerBox. So the two battery inputs of the Rx are not used. 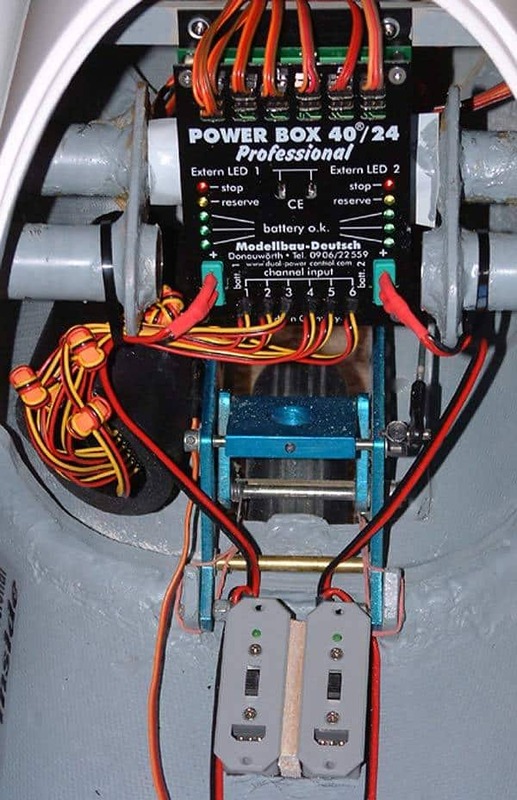 It is recommended to connect all servos that need high power or servos with long cables to the PowerBox instead of to the Rx as the PowerBox repeats and de-jams the signals (ailerons, elevator, rudder). The RX 12 IPD is designed for standard applications. 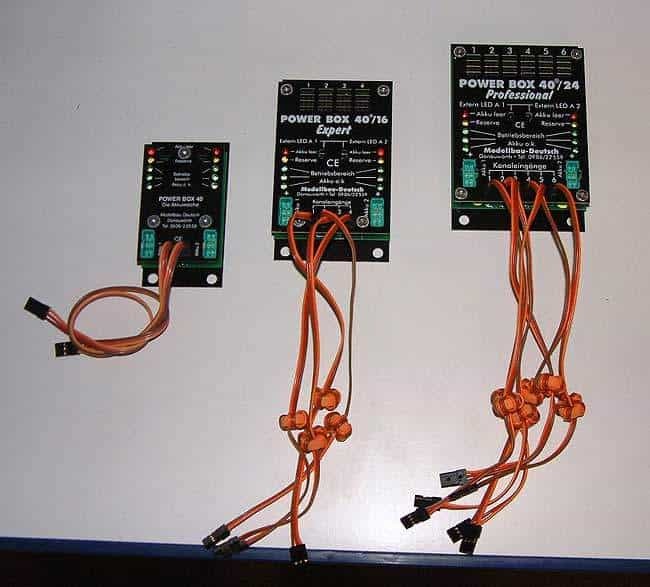 If you use more than 10 servos and servos with a big receiver power or long cables than Multiplex recommends to use a high-performance dual power switch like the PowerBox. This next picture shows the 3 P/B versions he makes from the Std Battery Backer to the next version the 40/16 Expert,- & then the Pro 40/24 version.